Australia's controversial shark cull program, which has already garnered its fair share of criticism in the past few weeks, has created another problem for the sharks of Perth's beaches -- now, a local news site reports that sharks caught on drumlines are being bit by other passing sharks. The drumlines, which were set up less than a mile from shore with baited hooks attached, are meant to attract sharks so that they can be killed by squads in boats with guns. This is considered the most "humane" method to decrease shark attacks on humans by the government. But that may not be so, considering a statement given by a spokesman for the Department of Premier and Cabinet in Western Australia. 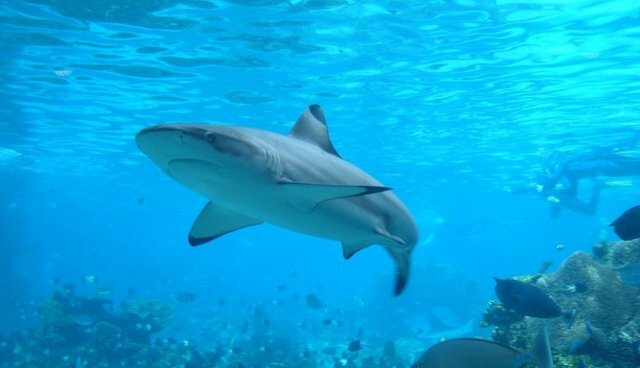 "Both the fishing contractor in the SW and the fisheries' crews are reporting minor evidence of bites on sharks caught on the lines, probably from other sharks," he said, according to WAToday. While sharks can usually smell bait on a line from a few hundred feet away, Shark expert Hugh Edwards says that sharks that are "thrashing about" on hooks will release stress signals into the water, which will attract other sharks from even further away and make them essentially sitting ducks. "Sharks can pick up body vibrations and blood from kilometres away," he said. Meanwhile, Humane Society International (HSI) has joined the chorus of voices in opposition to the controversial cull. Western Australia's cull, says HSI, breaches the Convention on the Conservation of Migratory Species of Wild Animals, which prohibits the taking of migratory species except under "extraordinary circumstances." HSI says that this "extraordinary circumstances" clause cannot be applied to WA's shark culling program, according to Michael Kennedy, HSI's campaign director, who spoke to the Guardian. So far, more than 30 sharks are thought to have been caught on drum lines in West Australian waters, despite protests from scuba divers, surfers, scientists, conservationists and even the family of a shark attack victim. Learn more about what you can do to stop the shark cull here. And you can find petitions against the cull on Change.org, TakePart and Greenpeace.